Is there anything that represents America better than a powerful truck hauling a huge flag? Chevy recently announced the 2017 Silverado HD will be offered with a redesigned 6.6-liter turbo-diesel V8 engine, which cranks out 445 horsepower and 910 lb-ft of torque. 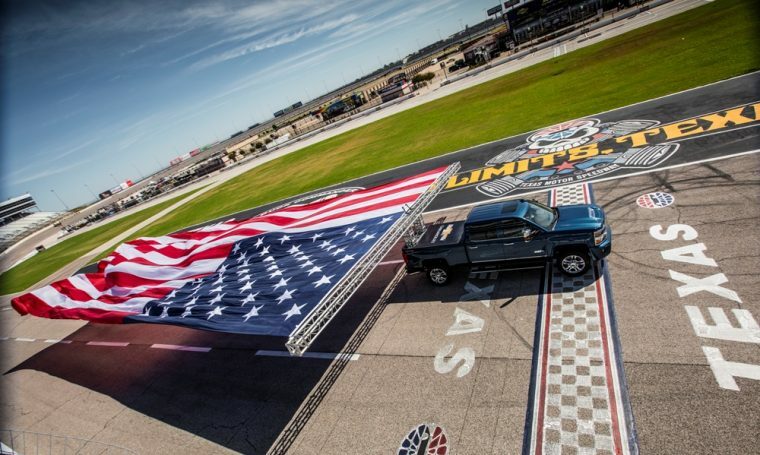 So, in an effort to show the performance capabilities of this new engine, Chevy brought the ‘17 HD to Texas Motor Speedway where the truck set a Guinness World Record for the World’s Largest Flag Pulled by a Moving Vehicle. GM enlisted the services of 20 people who launched and retrieved the flag so that it would not touch the ground at any point. In fact, all the truck was required to do in order to set the record was tow the 3,186-square-foot flag just 328 feet with the flag flying behind the truck, but Chevy decided to flex some extra muscle by hauling the American flag around the racetrack for a total of four laps. Also, to pay tribute to the state that hosted this event, the new Silverado HD then pulled the state flag of Texas around the track after it was done with the US flag. Both the 2017 Chevrolet Silverado HD and 2017 GMC Sierra HD will be offered with the redesigned turbo-diesel motor that was used to power the truck which set the aforementioned Guinness World Record. To make sure that engine doesn’t overheat, both GM trucks will also feature a new functional hood scoop that will feed cool, dry air to that diesel motor. Moreover, GM says the 2017 Silverado can accelerate from 0 to 60 mph in just 7.1 seconds, but that’s when it’s equipped with the updated diesel engine. Tim Shults likes to play golf and spend time with his four daughters.